"We are used to thinking of materials as having a static set of properties," said Samuel I. Stupp, co-corresponding author of the paper. "We've demonstrated that we can create highly dynamic synthetic materials that can transform themselves by forming superstructures and can do so reversibly on demand, which is a real breakthrough with profound implications." The results are reported today (Oct. 4) in the journal Science. Stupp is director of Northwestern's Simpson Querrey Institute and is the Board of Trustees Professor of Materials Science and Engineering, Chemistry, Medicine and Biomedical Engineering. Erik Luijten, Professor and Chair of Materials Science and Engineering and Engineering Sciences and Applied Mathematics, is co-corresponding author. When filaments containing complementary DNA sequences that could form double helices were mixed, the DNA-containing molecules designed to create double helices "jumped out" of their filaments to organize the unique complex superstructures, leaving behind the molecules without DNA to form simple filaments. The DNA superstructures, containing millions of molecules, looked like twisted bundles of filaments that reached dimensions on the order of microns in both length and width. The resulting material was initially a soft hydrogel, which became mechanically stiffer as the superstructures formed. The structures were hierarchical—meaning they contained ordered structures at different size scales. Nature does this very well—bone, muscle and wood are hierarchical materials—but such structures have been very difficult to achieve in synthetic materials. To better understand how this process worked, Stupp connected with Luijten, a computational materials scientist. Luijten, with his graduate student Ming Han, developed simulations that helped explain the mechanics behind how and why the bundles formed and twisted. In such simulations, Han and Luijten could examine how each part of the designed molecules could govern the creation of the superstructures. After extensive computation—each calculation took weeks on Northwestern's Quest supercomputer—they found that the molecules did not need DNA to bundle together but could be formed in principle by many other pairs of molecules with chemical structures that interact strongly with each other. 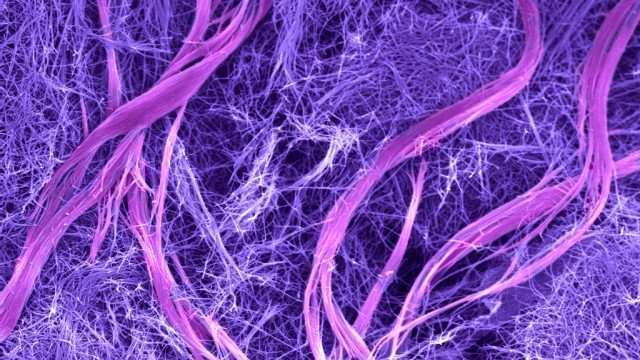 "Based upon our understanding of the mechanism, we predicted that just positive and negative charges on the surface of the filaments would be sufficient," Luijten said. That meant such superstructures could be created without the presence of DNA, in a completely synthetic material. "Now that we know this is possible, other scientists can use their imagination and design new molecules in search of these new 'dynamic' materials that reorganize internally on demand to change properties," he said. The new materials also led the researchers to a biological discovery. They took astrocytes—cells in the brain and spinal cord associated with neurons—and placed them on the new materials. Astrocytes are important because when the brain or the spinal cord are injured or diseased, they acquire a specific shape known as the "reactive phenotype" and produce scars that are dense fibrous networks. In the healthy brain, astrocytes have a "naïve phenotype" and a different shape. Interestingly, when the researchers placed astrocytes on the material with only simple filaments, the astrocytes had a naïve phenotype, but when the superstructures formed they became reactive. They then reverted back to the naïve phenotype when the hierarchical structure disassembled. This discovery linked the architecture of the cell's microenvironment to these critical changes of phenotype in injury and disease of the central nervous system. "The cell responded to the structure of the material in its environment," Stupp said. "It gives us new ideas on how to undo the scars in injured or diseased brain and spinal cord."